There are only so many times I can use the word “breathtaking,” so Free Solo has me inventing some new ones. “Sweatpalming”? “Gutknotting”? “Fascinating” works, too. It’s all of those, a totally enthralling account of one man’s quest to do the unthinkable, and the uncommon psyche that drives him to do it. 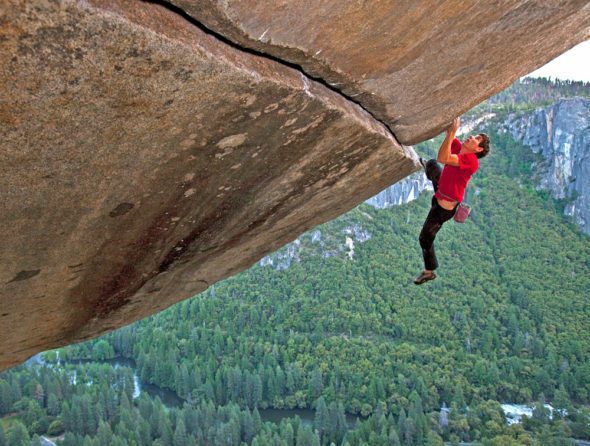 Alex Honnold became hooked on rock climbing at an early age, eventually dropping out of Cal-Berkeley to live in a van and devote himself to the climb. Recognition and sponsor money soon followed, until his increasing devotion to climbing without safety equipment (“free soloing”) caused some sponsors to withdraw support, citing concern for pushing the boundaries of risk. Directors Jimmy Chin and Elizabeth Chai Vasarhelyi, plus a very visibly nervous crew, were there to document the climb with truly awe-inspiring footage that demands to be seen on the biggest screen you can find. You will marvel at the accomplishment even as you doubt Honnold’s sanity, which makes the second layer of the film that much more meaningful. As they did with the mountain climbers in their 2015 doc Meru, Chin and Vasarhelyi want to get in their subject’s head, even following Honnold into an MRI brain exam when he wonders if there might be a biological reason for his death-defying urges. It’s his upbringing, though, one of few displays of affection and a constant need to perform, that’s more revealing. We see Honnold as an extremely bright young man undeterred by societal concerns, yet consistently trying to self-access and become more social. At 23, he thought it was best to practice the strange act of hugging. This is merely one contrast in a film of many. Even the filmmakers, committed as they are to the project, question the affect their very presence might have on Honnold’s decision-making. It’s all never less than compelling. But in contrasting glorious human achievement with acceptable sacrifice, Free Solo becomes nearly unforgettable.